October 24, 2011 - Passenger growth at Miami International Airport continued to surge in the third quarter of 2011 with an increase of 9.6 percent in September, keeping the airport on track to surpass its best year ever in 2010.
International passengers jumped 12.7 percent while domestic passengers also improved by 6.8 percent. Through September, passenger traffic at MIA grew 7.2 percent compared to 2010, for a total passenger count of nearly 28.6 million in 2011. Calendar year-to-date statistics through August, which are the most current data available for all airports nationwide, show MIA's growth to be the highest among all U.S. airports (see the attached report by LeighFisher, Inc.). MIA's success has been boosted by hub carrier American Airlines, which handled 5.7 percent more passengers at MIA in the fiscal year ending September 30 and has 63 percent of the airport's market share. New and expanded service by other carriers has also contributed to MIA's rising numbers. Based on a scientific study of Official Airline Guide schedule data for more than 650 airports and approximately 100 airlines operating in the U.S., aviation industry website Airline Network News and Analysis (anna.aero) named MIA ?U.S. Airport with the Most New Airlines in 2011.? 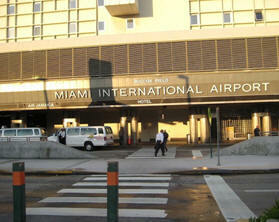 Miami International Airport (MIA), formally Wilcox Field, is the primary airport serving the South Florida area. The airport is a hub for passenger airlines American Airlines, Executive Airlines under the American Eagle name; cargo airlines, UPS Airlines and FedEx Express; and charter airline Miami Air. It is a focus airport for LAN Airlines and its subsidiaries, both for passengers and cargo operations. Miami International Airport has passenger and cargo flights to cities throughout the Americas and Europe, as well as the Canary Islands off the African coast, and cargo flights to Asia; it is South Florida's main airport for long-haul international flights. Miami International Airport is the largest gateway between the United States and Latin America, and is one of the largest airline hubs in the United States, owing to its proximity to tourist attractions, local economic growth, large local Latin American and European populations, and strategic location to handle connecting traffic between North America, Latin America, and Europe. In the past, it has been a hub for Braniff International Airways, Eastern Air Lines, Air Florida, the original National Airlines, the original Pan Am, United Airlines, and Iberia. Miami International is also the proposed hub of two new start-up airlines, one of which hopes to use the Eastern Airlines name.